Ferrer, J.; Peña, M.; Susin, A. 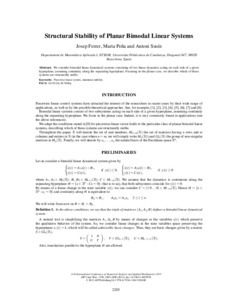 Structural stability of planar bimodal linear systems. A: International Conference on Numerical Analysis and Applied Mathematics. "AIP Proceedings 11th ICNAAM 2013". Rhodes: American Institute of Physics (AIP), 2013, p. 2205-2208.